Noted British music photographer Barry Plummer will see four books published by us starting early in 2015. I first got to know Barry years ago when working on the packaging for an Ian Gillan archive release (on the RPM label). For the cover we had found a great uncredited monochrome shot of the singer relaxing with an acoustic guitar, printed in a old German magazine. Unable to trace the original, I copied it on negative and then hand-coloured it directly onto the print (which shows how long ago this all was!) for a retro look. It worked really well for the project. About a year later I got a call from Barry, saying he thought the photo was his and might there be any payment due? This immediately impressed us, as so many people would have been screaming down the phone and threatening lawyers. We did a deal with Barry and have been using his photos ever since. Earlier this year I was chatting to Barry about his long career (he started out in the late sixties covering Hendrix and people) and suggested trying a few single artist photo books to see what would happen. He didn’t think there would be much interest but was happy for us to have a go. As someone has “borrowed” one of our ideas lately you will understand that we are a bit reluctant to charge in and announce all the titles right now, suffice it to say they will cover four major acts and music genres. But we can announce the first title as this is well into production already. Barry photographed Deep Purple from 1971 through to 1974 on several of their British tours, working mainly for the music paper Melody Maker. This book will bring together the best of his unpublished images, fully annotated and with accompanying illustrative material, interviews and memorabilia. We will publish updates on this title on a dedicated page on the site. Although large format, limited, and produced entirely in the UK, the books will be reasonably priced, with full details announced shortly. In the meantime the photo above comes from the band’s one and only Mk 3 UK tour in 1974, a lengthy series of dates designed to introduce the new singer and bassist, David Coverdale and Glenn Hughes respectively. Barry spent part of the show up in the gods, getting this great view of the band and a very enthusiastic crowd. 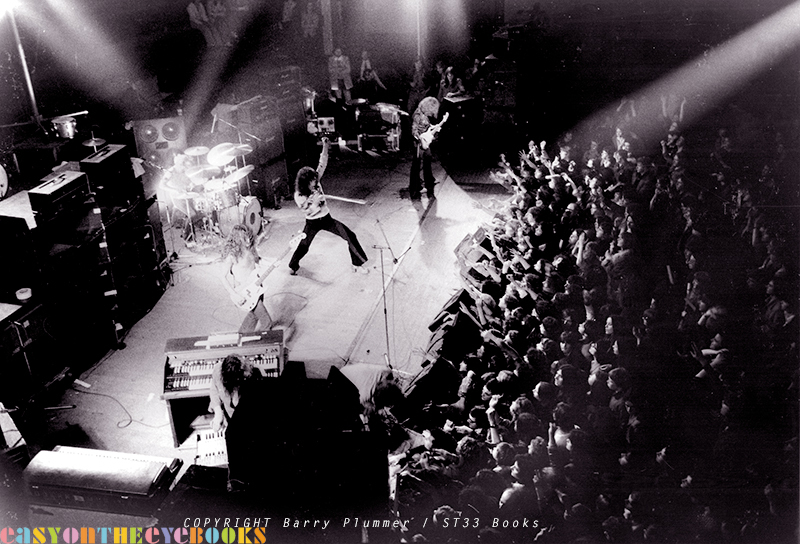 This entry was posted in Barry Plummer, Deep Purple, Musicians, Photographers and tagged 1974, Barry Plummer, Deep Purple, Ian Gillan, ST33 Books. Bookmark the permalink.